Spring Home Buying/Selling Season Has Arrived in Santa Clarita!! Year-to-Year – Single Family Homes**: The number of new listings in the Santa Clarita Valley area increased by 16 percent from March 2018 to March 2019, ending the month with 321 new listings. The total number of active listings increased by 24 percent to 556 total active listings from year-to-year. The average sales price in the SCV area is $653,404. The average sales price in the Santa Clarita Valley area went down 3.5 percent year-to-year. 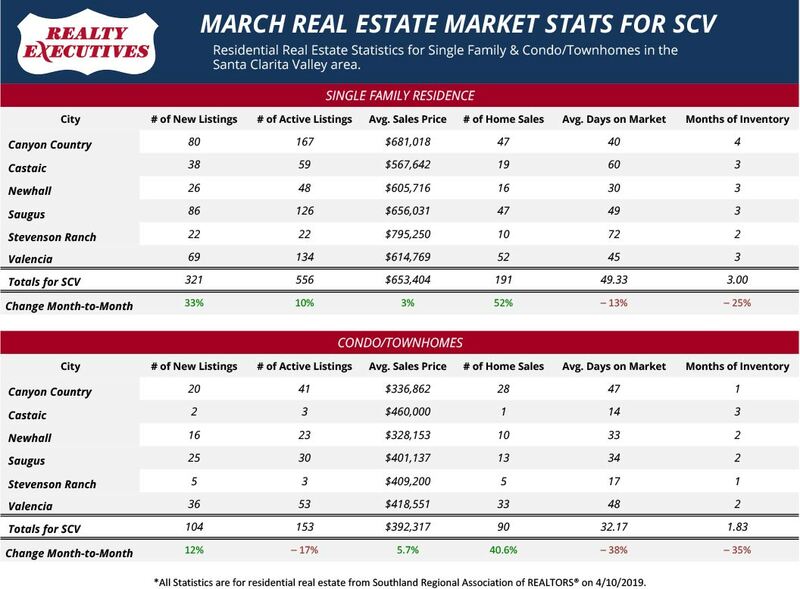 The number of homes sold in March 2018 decreased 6.8 percent from March 2018 to 191 SFR home sales in March 2019. 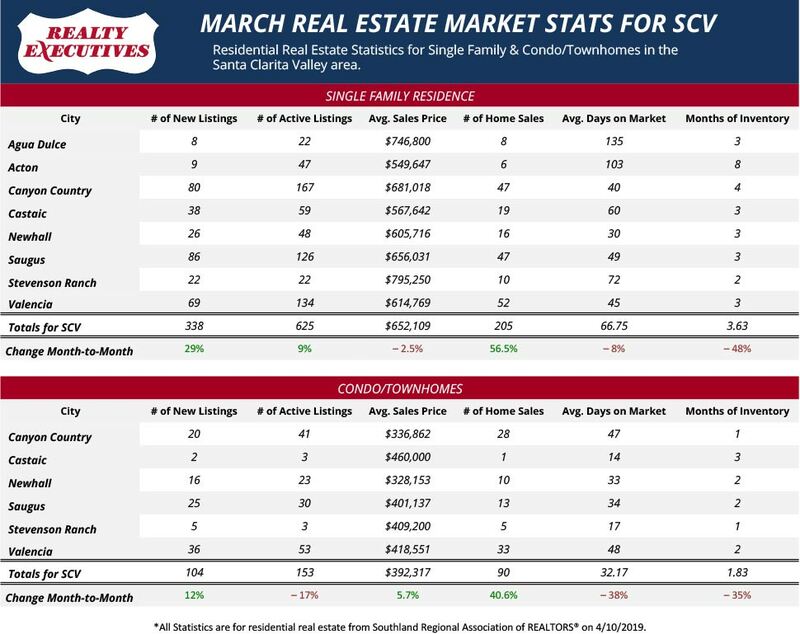 Month-to-Month – Single Family Homes**: The number of new listings in the Santa Clarita Valley area increased by 33 percent from February 2019 to March 2019, ending the month with 321 new listings. The total number of active listings increased by 10% to 556 total active listings. The average sales price in the SCV area is $653,404. The average sales price in the Santa Clarita Valley area went increased 3 percent from February to March. The number of homes sold in March increased 52 percent from February with 191 SFR home sales. March averaged just less than 50 days to sell, a 13 percent decrease from February. March ended with 3 months of inventory, a 25 percent decrease. Month-to-Month – Condos & Townhomes**: The average sales price in the Santa Clarita Valley area is $392,317. The average sales price around SCV went up 5.7 percent from February to March. The number of home sales jumped over 40 percent in March with 90 sales. Santa Clarita Valley area’s condos & townhomes resale inventory is 153, which decreased 17% from February. The number of new listings in the Santa Clarita Valley area increased by 12 percent from February with 104 new listings in March. March averaged 32 days to sell and ended with less than 2 months of inventory. 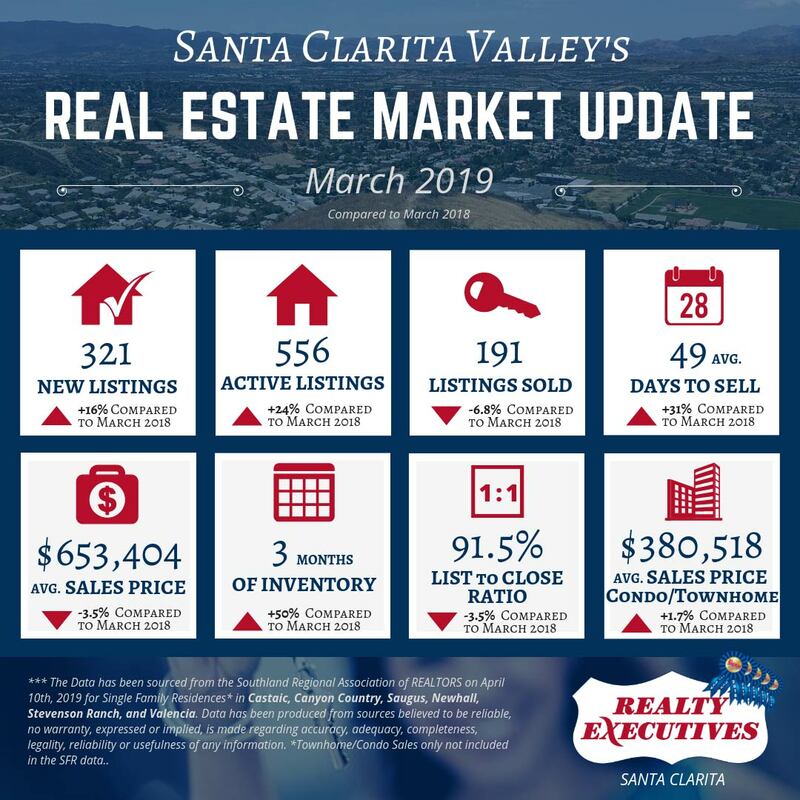 Month-to-Month – Single Family Homes*: The number of new listings in the Santa Clarita Valley area increased by 29 percent from February 2019 to March 2019, ending the month with 338 new listings. The total number of active listings increased by 9% to 625 total active listings. The average sales price in the SCV area is $652,109. The average sales price in the Santa Clarita Valley area dipped 2.5 percent from February to March. The number of homes sold in March jumped over 56 percent from February with 205 SFR home sales in March. In March, days to sell averaged just less than 67 days and ended with nearly 4 months of inventory.